Before the summer of 2014 we published a review of the double EP album of Courtney Barnett (read here: http://wonomagazine.blogspot.nl/2014/07/the-double-ep-sea-of-split-peas-2.html). A post that slowly built momentum and with the release of Ms. Barnett's new album is clicked on lot, making it the second best read post of 2014, to date. The quality of the EP album made me really, really curious for Sometimes I sit and think, sometimes I just sit. The start is pleasantly recognisable. Courtney Barnett kicks off with some 2015 Australian form of punk and rock. Raw, rough and with an attitude that is about to punch you full on the chin or worse. Guitars and loud rhythms are dominant over which she is not even trying to resemble anything called pretty. The opening itself is The Velvet Underground in style and playing, although a little more jangly. 'Elevator operator' reminds me of 'Waiting for my man'. At the same time cleaner and dirtier. Executed cleaner, played a little dirtier. Something like that. 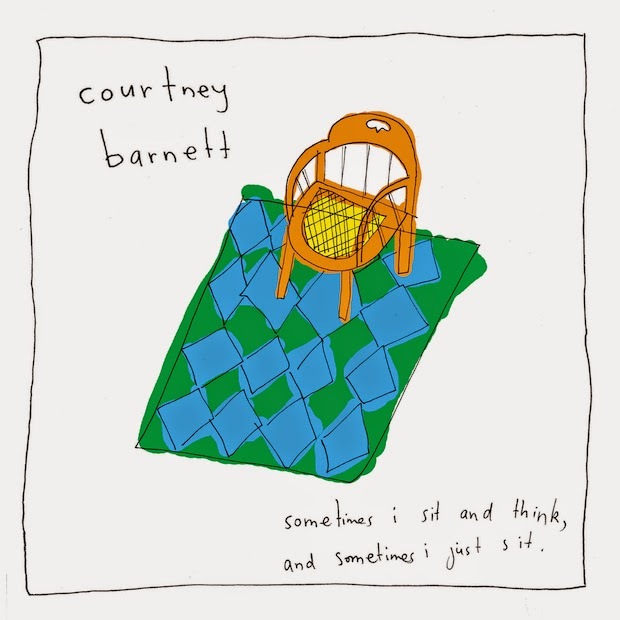 Great opening song, that puts Courtney Barnett right back where she ended with her EP. 'Pedestrian at best' even goes beyond this, ways and ways. This is ugly, nails out to scratch at heart and guts level as well as kicking someone hard in the confidence part of the brain, all the way. Why would anyone be so rude to any one? The is chainsaw sawing off at the knees of a person and his character and personality. "I think you're a joke, but I don't find you very funny' is the most friendly wording sung to the subject of this rant. And yes, it's funny too. As non-compromising as that other Courtney was on her best records. Great, great song and there may be just a tat uncertainty behind this huge screen of relentless pounding too. A lot to think of 'Pedestrian at best' offers its listeners. Luckily the brake goes on a little. There's no going over the previous song or remaining there. As a listener I might just be flattened out as well. 'An illustration of loneliness (Asleep in New York)' is a different sort of rocker. Mid-tempo, again with a VU sauce in the background. A fun riff all through the song. Mid-tempo but punky non the same. 'Small poppies' really changes the mood to something jazzy. If anything 'Small poppies' shows how versatile Courtney Barnett is while still holding my attention no problem. Angel Olsen comes to mind, not for the first time this album. The ladies are somewhat akin I'd say. Of course guitars dominate this song as well, quite loudly at some point too. The fact that 'Small poppies' is so different and convinces, is proof of Ms. Barnett's potential and talents. She can develop herself in many and very different ways and probably remain quite interesting to follow. Listening to Sometimes I sit ... my overarching opinion is that Lou Reed is a large influence on this album. The album is roughly built up, like a Reed album could be. A rocker, a real soft ballad, some pop, some pre-punk, something jazzy and finally something nasty. To this mix Courtney Barnett brings herself and adds her voice. She may not be a singing angel, she definitely sings better than Lou Reed. A more frivolous atmosphere is the other thing she adds to her mix. Does that make her better? I'm not at that point yet. This is not a five star album 'The Velvet Underground' or 'Transformer' is. This is her first album, so there is a lot to do and learn. As a first album Sometimes I sit ... is just fine. It builds on the impression of 'The double EP ...' and expands from there. Growth this album is. Musically it may be fairly basic, the direct way of playing and singing give it its own pace and mood. Just the way Courtney Barnett plays with the lyrics and the length of them compared to the melody, e.g. in 'Dead fox', makes a lot of words that most would not dare to put there, while she just keeps on going, is fun. Yes, Bob Dylan style that is. She gets away with it quite nicely. Music lovers anywhere between Veruca Salt, The Velvet Underground and The Sexpistols should find their way with Sometimes I sit and think, sometimes I just sit. It holds something for all, without giving anything away. Courtney Barnett is all over this album. She certainly holds her charms for me. Another large step to becoming a true fan has been set.